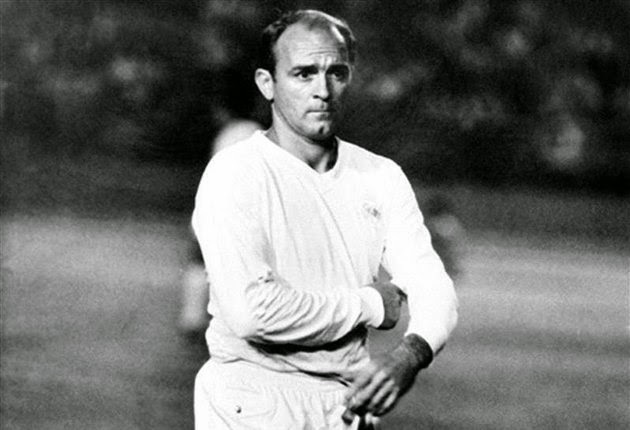 Alfredo Di Stéfano, arguably one of the greatest players of all time, has died today at the age of 88 at the Hospital General Universitario Gregorio Marañón in Madrid. The Real Madrid legend, Di Stéfano, suffered a cardiac arrest on Saturday, while walking on a street near his beloved Bernabéu stadium just a day after his birthday. After hearing of Di Stéfano’s passing this morning I thought back to my trip to Madrid in 2006. After visiting the Bernabéu, and seeing the impressive trophy room lined with so many cups that the man nicknamed "Saeta rubia" ("blond arrow") had helped deliver, I stopped in at a coffee shop across from the ground. After ordering my coffee from an old man at the counter, he asked me in nearly perfect English if I had been to the Bernabéu. After telling him that I had, he said to me that, “this club owes everything to Di Stéfano. 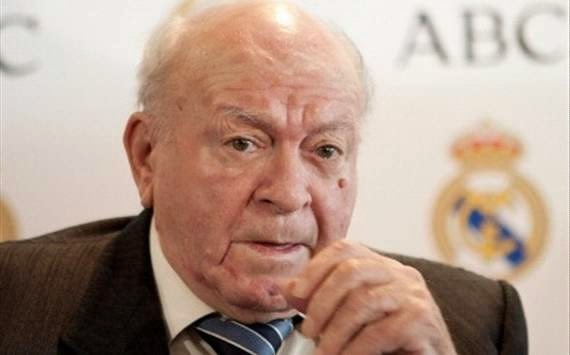 Don Alfredo was like a god and he created Madrid. People debate whether Maradona or Pele was the greatest player of all time and they are all wrong. The greatest was Di Stéfano”. The son of a first-generation Italian Argentine, Di Stéfano was born in Buenos Aires, Argentina on July 4, 1926. Beginning his career with River Plate, he went on to score an incredible 49 goals in 66 matches at the club. After a players strike in Argentina in 1949, Di Stéfano joined Millonarios in the unsanctioned Colombian League. After a seesaw battle between Barcelona and Real Madrid for his signature, which included political wrangling, Di Stéfano joined Los Blancos in 1953. Known as a player with brilliant tactical awareness, great stamina, a fierce personality and deadly eye for goal, Di Stéfano was the unquestioned leader of the greatest Madrid side in their history. During his time at the club, Real captured eight league titles and a staggering five straight European Cups. Di Stéfano scored in all five of those European Cup triumphs, a feat that will likely never be repeated. The blonde Argentine was known to start attacks in Madrid’s half, move the ball around to talented teammates like Paco Gento, and generally end up finishing off chances himself. He was comfortable operating all over the pitch and seemingly everything went through him. 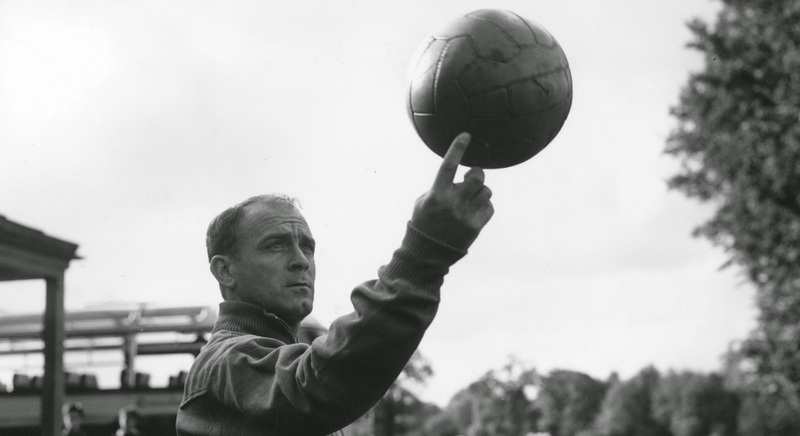 Through a combination of injuries at key times and leaving his native Argentina at a relatively young age, Di Stéfano never played in a World Cup Finals. He did however win the 1947 South American Championship with Argentina, scoring six goals in the tournament. 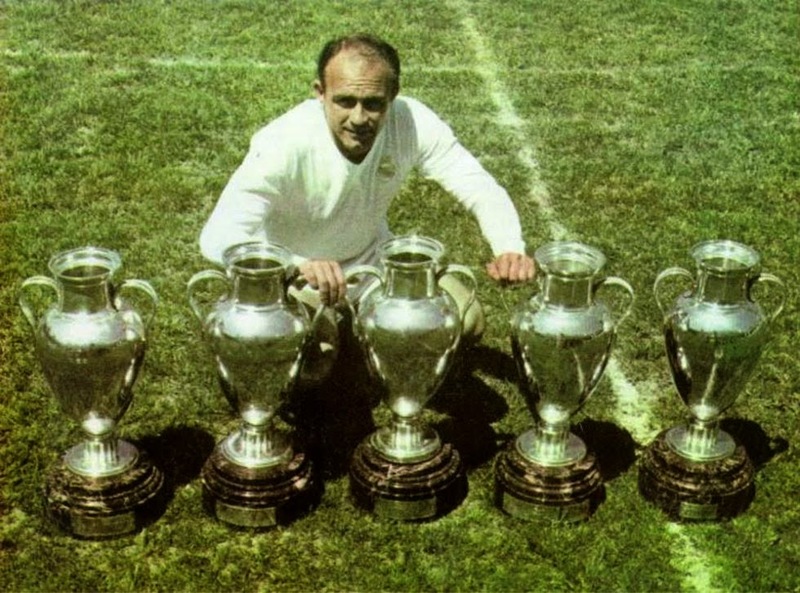 After his retirement as a player at age 40, Di Stéfano went on to manage several clubs including Madrid, Valencia where he won La Liga, the Copa del Rey and the European Cup Winners’ Cup, and both Boca Juniors and River Plate, where he won titles with both. In 2000 Di Stéfano was named Honourary President of Real Madrid and resided in Spain until his death this week. Rest in Peace Don Alfredo. The football world has lost a giant.